Today I had an idea to make a list of the procession of rulers in the World of Greyhawk setting. I'm sure most long term Greyhawk fans know this stuff, but to see it all in one spot may at least make for an interesting study. Just so you know, for obvious reasons I don't have data on rulership changes in the Living Greyhawk Campaign. I'll start from the1983 boxed set and work my way out (So the order is 1983, From the Ashes, Living Greyhawk Gaz). Red is an occupying ruler. Here we go. Ahlissa/South Province: Chelor, Reydrich, Reydrich (Xavender I is Overking of the United Kingdom of Ahlissa however). I found it fun and interesting how the complexity of ruler's names changed over editions, with authors gradually adding surnames or roman numerals; especially with barbarian rulers such as the Snow Barbarians which goes from a nameless king to a fully realized name. Also interesting, 21/51 countries listed maintained the same ruler over a relatively short timeline of 15 years. I don't know if that's realistic or not, but given the turmoil of wars I guess it should be less. Not surprisingly Free Cities tend to have the most stable governments and longest tenured rulers, as do the conflict free Baklunish nations. Even raucous Ull has only had one leader change in 15 years. 1) Forces of Iuz occupy the Bandit Lands but each town's rulership still technically varies. 2) Archbaron Bestmo, is called Besmo in FtA. A typo surely, not that it matters. 3) I couldn't find reference to the Bright Lands in FtA but I'm fairly sure Rary the Traitor was in the same era. 4) The secrecy of the Brotherhood is funny. So the FoB is unknown in 1983, but his identity is leaked in Greyhawk Adventures, confirmed by FtA, then it is reestablished as unknown in the LGG. Okay! 5) An old canon discussion. There was some confusion whether the ruler was Belissica or Lorgan. It seems evident Lorgan came first but was soon replaced by Belissica who is countess up through LG. That is a convenient list, Morteallan. It was interesting to look over. "Frost Barbarians: Ralff, Hundgred, Hundgred Rallfson"
You spelled 'Rallfson' differently than 'Ralff'. Is that a typo, or is that the way they spelled the names in the official products? Regarding the Scarlet Brotherhood, perhaps the return of "Father of Obedience" as a title is due to the uncertainty of whether or not Korenth Zan still leads. After the events in Fate of Istus, it is possible that Korenth Zan was either killed by the adveturers (unlikely) or overthrown by another faction without the Brotherhood. The Rulers were one of the things about the two timeline advances that struck me as the ultimate in lazyness on WoTC's part. 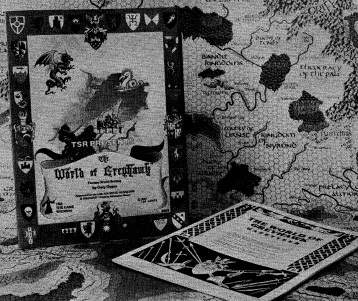 Gary Gygax & TSR started things off in 576CY with 60 sovereign nations (or city-states) of which I think 56 had named or at least identified rulers. Then "From the Ashes" advanced 8 years to 584 through the plot device of a continent spanning war in which all Hell broke loose (literally) and burned the Flanaess to ashes. It was probably the most disruptive event since the twin cataclysms. Several countries disappeared into history. New ones are created. Then the Living Greyhawk Gazetteer takes us ahead 7 more years to 591 during a period of relative peace and rebuilding. And yet in this whole 15 year span, only about a third of the countries change rulers, many of those by orderly succession from father to son or some other family member, or by the regularly scheduled election in the Yeomanry. This is historically absurd. Compare it to Earth. Take a Flanaess sized area, like Europe, Russia, Asia Minor, the Levant, and North Africa. I challenge you to find any 15 year interval between say Rome to WWI where more than half the sovereigns at the beginning were still in power 15 years later. During periods of war, plague or famine the turnover was often more like 75%. By the way, I'm pretty sure the Lorgan / Belissica thing was an editing or typesetting error in the 83 boxed set's Glossography's Rulers of Greyhawk list (and not the only one...). Looking elsewhere, it is clear that Belissica is the correct name. She is given as the ruler in the text of the "Urnst, County of" entries in both the 1980 Folio and the 83 boxed set's Guide book. The folio gives the ruler's Title, Class and Level (no name) right under the country name, and sometimes gives the name in the description text. The Guide gives Title & Name and has a separate list (in the Glossography) w/ name, class & level. for the County of Urnst the folio says "Her Noble Brilliancy, the Countess of Urnst (Fighter, 16th level)". Other than this (and a "+" on the end of Population: 200,000) the entry is identical to the boxed set's Guide. "F 16" is the Class & Level listed for the Erroneous name Lorgan in the Glossography. Interestingly, to the best of my knowledge, the name "Lorgan" does not appear anywhere else in Greyhawk canon. I concur Tom. Lorgan mysteriously cropped up and that's it AFAIK. As to ruler ship changes, a fantasy world has healing magic and other controls that could keep a person in power longer (being a demigod doesn't hurt either), or in some instances completely vanish in a moment's notice(like Ivid V). It is definitely remarkable that the Baklun/Nomad sphere is largely unchanged save a few instances. Must've been lack of focus on those regions? Xaris: Yeah probably a typo. Thanks for rooting that out you editor you. Sure, no surprise that long-lived demi-humans like the rulers of Ulek & Celene, demigods like Iuz, or supernatural beings like Ivid & Drax would tend to stay in power. But in the human realms, there are at least as many magical, mystical, diabolic & demonic ways to die as there are magical protections and healing. And despite supposedly having assassins in positions of trust in every royal court in the known world, Hassan i Sabbeh & the Society of Assassins, never imagined anything remotely like the Scarlet Brotherhood's plot for simultaneously killing heads of state accross the Flanaess. I would say that despite magical protections & healing, Oerth is still a much more dangerous place that Earth. Obama, Putin and other modern heads of State, no matter how despised, need not fear that someone could teleport (w/o error) in at any moment, stab them in the eye with a poisoned, soul-eating dagger and teleport away. Nice! That kinda reminds me of the Xmen movie with Nightcrawler jumping in/out of the white house. No argument on the more dangerous world. Technically, for most of 2e, Geoff was ruled by the fire giant King Mogthrasir. Grand Duke Owen was, and still is, in exile in Hochoch. Similarly, while Marquis Querchard was in exile in Keoland, Sterich was ruled by a giant named King Galmoor. Dunstan I was actually the 1st King of Nyrond, crowned somewhere around CY 437. The name Dunstan crops up a few other places as well: he is Count Blemu in the Gord novels, and he is a character in "The Gnome Cache", a story serialized in Dragon Magazine issues 1-7. And oddly, I have a margin note in my 1980 folio edition of World of Greyhawk informing me that Nyrond's current kind is Dunstan III, but that was 34 years ago and I have no recollection of why I might have written that. None of my players had gone near Nyrond yet, let alone encountered the king. Nice feedback tom! I would've never noticed that discrepancy. Yessir, Greyhawk canon is a funny thing back in the early days. It was left to later scholars to sort it all out!